Both sodium chloride (rock salt) and calcium chloride will remove snow and ice, BUT they are harmful to pavers and ANY concrete surface. Products that contain Calcium Magnesium Acetate as their active ingredient are considered safer for application to your paving stones. If this is not available, try for a product such as magnesium pellets or flakes. Pavers may be plowed and shoveled, just like asphalt and concrete. In fact the chamfered edges and joints around the pavers help in the melting of snow and ice. If you are plowing an area with pavers, a plow with a rubber edge is a good idea to protect the finish on the pavers from scratching. 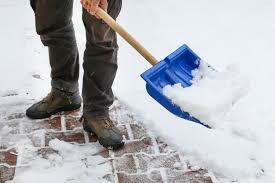 Also, try to avoid using sharp or metal objects to “chop” at ice as they can damage the finish of the pavers or concrete.